Weeks ago you decided to throw a holiday party, and the time to get everything ready has finally arrived. Unfortunately, so have all the other holiday season distractions. Don’t let the stress kill your Christmas spirit! We sharing our favorite party prep hacks and cleaning tricks that will have your home looking great in no time. Pick a theme – Having a theme that includes a color scheme will make it much easier to decide on decorations and even what food to serve. Start clearing out clutter and cleaning days in advance – This will ease some of the cleaning burden and help you start getting things into place. Give the bathroom a deep cleaning – If there’s only one place in the home that gets an extra good cleaning make it the bathroom. Many guests will find their way to the bathroom at some point and there are no distractions while they’re in there. Also, don’t forget to keep it well stocked with toilet paper, soap and clean hand towels. Wash all dishes and empty the dishwasher before the party – That way you have a place to keep dirty plates out of the way and out of sight. Clean out the fridge – It will give you more space for the party food and keeping leftovers tucked away during the festivities. Prepare as much food as possible in advance – If you want your kitchen to look its best, prepare food the day before the party. That way you won’t have to spend hours cooking on the day of the event and can focus on getting the kitchen cleaned up. Use oven-to-table servingware – Easier to get things done and less dishes to clean. Take the time to dress up the entry – There’s one spot every guest is guaranteed to see – the entryway. Completely de-clutter around both sides of the front door, add a wreath and clear out a space for guests’ coats. Don’t forget to stage an outdoor entertainment area – Even in the dead of winter some people prefer to congregate outside. The key is to have seating options and a safe heat source like a cozy, covered fire pit. Also, make sure the space is clear of debris that could trip people up in the dark. Need to get your house clean in a hurry? Too tired to clean up after hosting a holiday party? Kick your feet up and let Maids by Melissa get things squeaky clean. Every year we help dozens of families in Lakeway and Austin enjoy the holidays instead of stressing about the cleaning details. 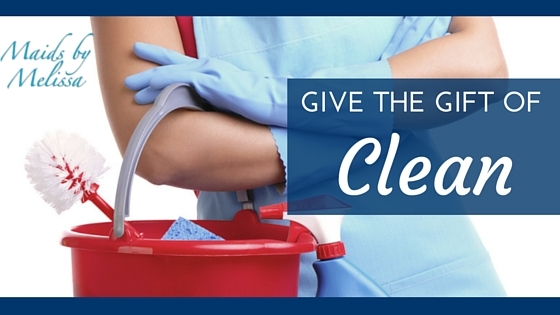 Give yourself the gift of a professional house cleaning this holiday season!